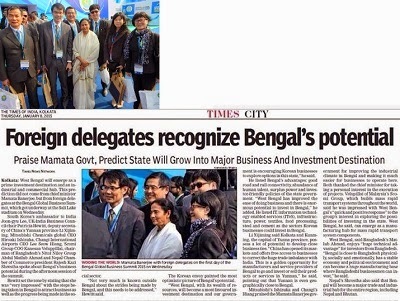 Taiwan Delegation group was here in Kolkata to attend the West Bengal Global Business Summit January 2015. Attended by Taiwan Companies that include - Asia foremost leading specialty manufacturer of non-woven and related products in personal hygiene and skin care; World’s leading Brand in the space of Mobility Rehabilitation Care for Physically Challenged and Senior Citizen Population headquartered in Kolkata and a major player in India occupying a 45% market share; Taiwan top banking and financial company based out of Delhi ; Taiwan’s largest engineering, procurement, and construction (EPC) firm in Taiwan based in Delhi also came here to see the possibilities of extending their company over Eastern part of India; & TWTC the foremost Trade promotion in India to promote Bi-Lateral trade between India and Taiwan for Taiwan Manufacturers and Exporters. TWTC trade promotion officers Mr. Rajiv Dey and Ms. Elizabeth Lee to visit Top Indian Companies based in Kolkata to personally invite Indian Buyers to visit Taiwan, Procure from Taiwan and build up trade relations with Taiwan. Special focus will be put on Sourcing Taiwan(31st March – 1st April) – Taiwan’s largest annual procurement meeting spread across various industrial products. Minimum turnover of USD 5 million. Never received any incentive from TAITRA in 2014 for exhibition or procurement meetings. Only 1 person allowed to avail incentive. Deadline to apply 29th of January 2015. Please Fill the ‘Trade Inquiry Form’, and revert to us by email/Fax. b. Why visit TIMTOS 2015? TIMTOS (The 2015 Taipei Int’l Machine Tool Show) is bench marking its 25th cycle at unprecedented size and scale to offer a vast expo of advanced machine tools, valuable seminars, award-winning products and more! This expo is based upon an industry with four winning decades of growth which now places Taiwan as the world’s fourth largest exporter. Your visit to this dedicated expo next March 3-8 links you to 1,010 exhibitors with 5,400 booths who will connect with a projected 7,000+ visitors from more than 100 countries. The total exhibition area of over 100,000 square meters, firmly secured ASIA'S SECOND LARGEST MACHINE TOOL EXHIBITION, is the focus of attention of the world's machinery industry. This exhibition is the first International exhibition of the year 2015, in addition to a grand scale display outside. Exhibition highlights including: "high-efficiency automated production" as the theme of the exhibition; added "carrying homemade controller" display area; And for the first time in Round Hill blooming Museum of metal forming machine. We welcome local access providers, enterprises and other buyers to come to Taiwan to visit and purchase.